For many homeowners, the installation of code-approved hurricane shutters simultaneously delivers superior storm protection, peace-of-mind and reduced insurance premiums. 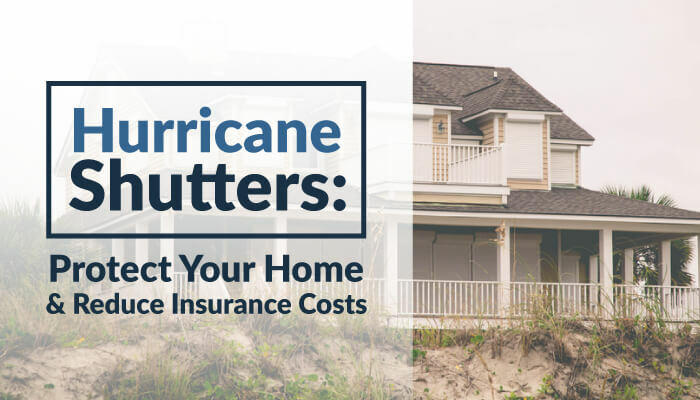 Without hurricane shutters, you may be stressing more than you need to, and you may be wasting money on excessive insurance premiums. Although you can’t hermetically seal your home against every hurricane threat, you can protect those vulnerable openings with quick-to-deploy, code-approved hurricane shutters. With the right storm shutters, you can end the “plywood shuffle,” that mad scramble for plywood protection that happens whenever a bad storm approaches. Prospective homebuyers recognize the advantages of hurricane shutters as well. This may make your home more appealing if you decide to sell, and it may even increase your home’s resale value. What is a Code-approved Hurricane Shutter? The Florida Building Code, like many state codes, is largely based on the International Building Code (IBC) and the International Residential Code (IRC). The IBC and IRC rely on test methods ASTM E1886 & E1996 to measure the wind and impact resistance of hurricane shutters. The Miami/Dade County code relies on TAS 201, which uses both large impact and small impact testing on windows and shutters. For the large impact, a lumber cannon fires a nine-pound 2×4 at the target at 50 feet per second. The small impact test fires 10 ball bearings at the target at the same velocity. Both the product and the installation method must be in compliance with product drawings and installation instructions compiled by Miami-Dade County and the State of Florida. Wind Mitigation Credits reduce homeowners’ insurance premiums when it is possible to certify that roof construction, secondary water resistance and/or the protection of openings meet exacting standards. From experience, property insurers know that compliant, code-approved storm protection can substantially reduce the cost of claims. In Florida, you can save up to 42 percent on the hurricane/wind portion of the premium. Although discounts vary from state-to-state, they are required by law in many places along the East Coast. Florida, for example, requires Wind Mitigation Discounts, although its laws don’t mandate specific discount percentages. Other states, like Alabama, require insurers to discount premiums by specified percentages. It is important to note that discounts apply only to the wind/hurricane protection portion of your policy. However, if such coverage is included in the overall policy premium, the discount must apply to the entire premium. Securing an insurance discount is as easy as 1, 2, 3. Fortunately, you have a wide selection of code-approved shutters to choose from. The architectural detail of your home may guide your decision. For example, some hurricane shutters are more ideal for second-story protection than others. Some add charm and curb appeal between storms. Once your new hurricane shutters are fully installed, arrange for a visit by a certified wind mitigation inspector. Once your inspector has completed the work, he or she will complete a Uniform Mitigation Verification Inspection Form certifying that you’ve added code-approved wind protection to your home. Make a copy of the form for your records, and mail the original to either your insurance agent or your insurer. A quick call to your agent is recommended to ensure you follow the correct procedures. Once you qualify for the Wind Mitigation Credit, you’ll enjoy lower premiums every year. Over time, the accumulated savings will put a substantial dent in your initial shutter investment. Since 2000, we’ve delivered code-approved hurricane shutters to residents in Florida and across the country. We’d welcome the opportunity to demonstrate how our custom-fabricated shutters can meet your needs. Please contact us today! Call 772-299-1955 or send us an email us at info@pcshuttersusa.com.